PRODUCT DESCRIPTION: The 2250 duster is an electric device which enables the user to apply large amounts of dust to vast areas quickly. It will push the dust 30 to 45 feet and allow for hard to reach areas to be properly treated. Hello! Finally found your products! We have a wasp problem under our metal roof. They come into the house when summer really heats up. Which products and applicators would you recommend? My husband and I have looked at several of your videos–and are at a bit of a stalemate. I wish to pursue an aggressive method like a wide area applicator like maybe renting the BG applicator. I believe we need the Drione from your videos–husband agrees on that, too. Would like to know, however, if we used the rentable applicator and purchased the Drione–is that something we could do successfully ourselves in your opinion? Any other suggestions are definitely welcome! First, we have been renting the power duster for many years and everyone has been able to handle it easily. Remember, its designed to "help" and not hinder so in fact, it will make the task easier for all users. So if you have a large open attic space, this machine is perfect for getting the area properly treated. And it can do so from one location so you don't have to risk walking around the space. Conversely, if the area is 1000 sq/ft or less, a Dustin Mizer could probably do just as well and you could own it out right. As for what to use; the Drione is no doubt the "best" option. I'd get it applied too all gaps, cracks and voids around the roof since these are key entry points. Use a good hand duster and/or Dustick for this task. The attic should also be treated (which you seem committed to doing). Lastly, a good exterior spraying with Cypermethrin will really help. Its naturally "repelling" to all pests and wasps especially don't like it. Dusting at least once in the spring should carry you through most of the summer but retreat if needed. Typically the spray should be applied once a month unless there is no activity and then you can wait 30-60 days in between treatments. Once under control, dusting is usually only needed once a year; twice if you have a really bad problem and notice activity in the fall. I suspect your home could be a target in the fall for overwintering wasps and if that's true, dust it then too just to be sure none use it for hibernation. Haven't used it yet, but will VERY SOON! 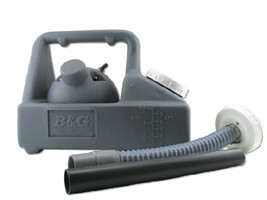 I'm looking forward to greater speed for wider areas that were not as easily accessed using the manual pump duster. That one was great for reaching the very high eaves of our home, but it turned out you were right–a wider area to kill the wasps still in our attic–I think this equipment will complete getting rid of our wasp problem for good! 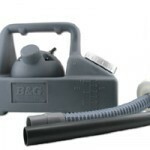 Do you sell the bg 2250 duster in a 220v . And post to singapore.. we have bought equipment from you previously in 220v.